SAN JOSÉ, CA – BALLET SAN JOSÉ Benefit GALA, an spectacle, which will include world-wide known dancers and guest artists from all over the world, will be presented on Saturday night,November 16th, at the S.J. Center for the Performing Arts. World-famous dancer, JOSE MANUEL CARREÑO, who planned the event, tells CULTURAL WORLD BILINGUAL, that the Benefit GALA will give the audience an idea of the direction that he, as new Artistic Director of BALLET SAN JOSE, will lead the Company. “This GALA is going to be tremendous,” he says, “and I am excited because I don’t think that San Jose’s audience ever saw before so many world-famous dancers, dancing in a single night, as they are going to see during the GALA. I have JULIE KENT, GILLIAN MURPHY, MARCELA GOMES, MISTY COPELAND, DANIEL ULBRICH, just to mention some. I am also bringing ballet dancers from San Francisco: TRAS DOMITRO, MARIA KOTCHETKOVA. It is going to be something unique. “Here (In Silicon Valley) there is a big Latin Community,” adds CARREÑO, “and my idea, when I accepted this job, was that I was going to start bringing to San José Latin choreographers that have never been seen here before." Because the 2013-2014 Ballet Season will be CARREÑO’s first as Artistic Director, we ask him how he feels about it. He smiles. The Benefit GALA program will include dancers from BALLET SAN JOSÉ and from the BALLET SAN JOSE school. Guest artist from AMERICAN BALLET THEATRE: MISTY COPELAND, MARCELO GOMES, JULIE KENT and GILLIAN MURPHY. Dancers from THE NEW YORK CITY BALLET: JOAQUIN De LUZ, MEGAN FAIRCHILD, GONZALO GARCIA, MARIA KOWROSKI, ASK La COUR, and MARIA KOWROSKI. 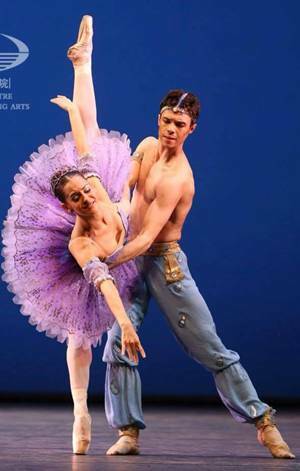 Dancers from THE SAN FRANCISCO BALLET: TARAS DOMITRO AND MARIA KOTCHETKOVA. Dancers from the BOSTON BALLET: LORNA FEIJOO and NELSON MADRIGAL, and International guests artists ADIARYS ALMEIDA and JOSEPH GATTI. The music will be played live by Symphony Silicon Valley Conducted by BSJ Music Director GEORGE DAUGHERTY.